BERLIN (Reuters) - German Foreign Minister Heiko Maas on Sunday criticised Russia for a series of activities beyond its borders, blaming it for a cyber attack on his own ministry, and said Moscow must change its ways. German government officials in February disclosed what they called an "isolated" cyber attack on the government computer network that was first discovered in December. The head of Germany's domestic intelligence agency last week said there was "a high likelihood" that Moscow was behind the attack. Maas, a Social Democrat who has adopted a tougher stance on Russia than his predecessors from the same party, told the other German public broadcaster, ARD, on Sunday that Moscow had been an increasingly "difficult partner" but Berlin was committed to maintaining dialogue, particularly on the crisis in Syria. "It is time, I think, to point out that we expect constructive contributions from the Russian side, including on the Syrian conflict. And also that they don't always simply protect (Syrian President Bashar) al-Assad," he said. Western air strikes aimed at destroying Syria's chemical weapons facilities have exacerbated tensions between Moscow and the West, already at a new post-Cold War high after the expulsion of more than 130 Russian diplomats in response to the nerve agent attack on ex-spy Sergei Skripal. 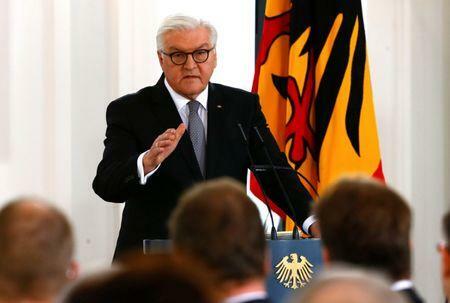 Steinmeier told the Bild am Sonntag newspaper he was concerned about a "galloping alienation between Russia and the West" and urged German politicians to avoid portraying Russia and its people as an enemy. Maas on Saturday called for a new international effort to end the war in Syria, and said Germany would use its relationship with Moscow to ensure Russia played a "constructive" role. "Whether we like it or not, the Syrian conflict cannot be resolved without Russia," he said on Sunday. Germany, which relies on Russia for about a third of the gas it uses, has long walked a careful line with Moscow -- pushing for continued sanctions over Ukraine and eastern Ukraine while also maintaining dialogue and trade relations.